We are thrilled to be able to share our love of good food with Eugene. Stephen and I shared our first meal together while cooking and camping with friends on the Oregon coast nearly 9 years ago. Since that auspicious beginning we have continued to cook and entertain our friends and neighbors first by opening up Delacata food cart and now Elk Horn Brewery. Stephen grew up in Mississippi and I am from the Willamette Valley, our food is a blend of those two backgrounds. Ask us about the many batches of collard greens and hushpuppies we made in our kitchen before serving them to Delacata customers! We built Delacata food cart business by offering up genuine southern hospitality. We have been delighted with the response that Delacata has received from Eugene area foodies and decided to launch Elk Horn with the belief that good food and a lot of hard work can bring success. Thank you Eugene for your support. 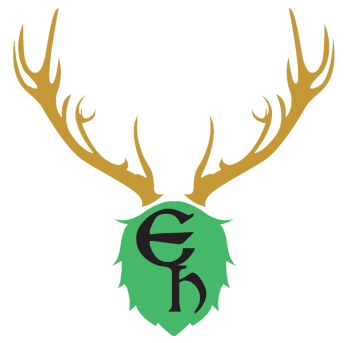 We are so excited to be able to continue and expand our offerings of fine food and hospitality at Elk Horn Brewery. Elk Horn Brewery is a gathering place for folks to dine and enjoy each others company. We craft our own beer, cider, and sodas in the same manner we make our food, with great care, intent and concern for our people and our community.